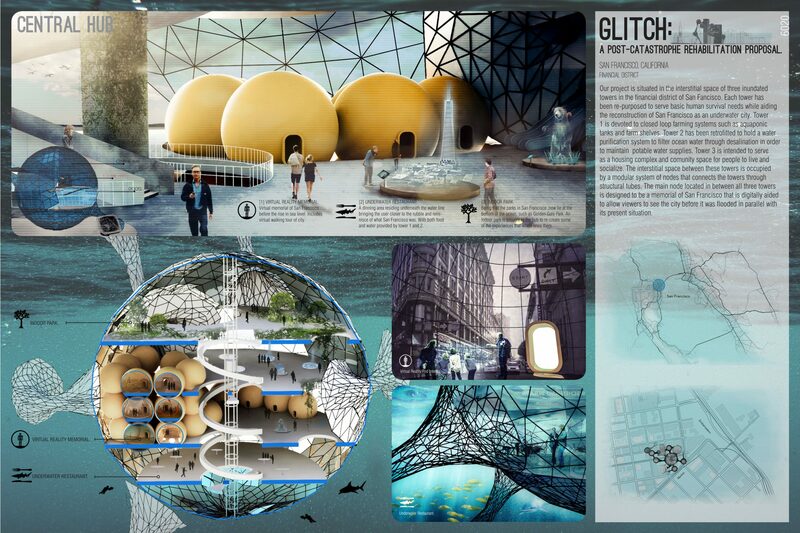 Glitch “a post-catastrophe rehabilitation proposal” | gURROO - A new generation of innovative minds. In a post-catastrophe setting where the world’s sea levels have risen to the point where major coastal cites are now flooded, people are forced to either adapt or move further inland. Due to the concurrent rise in population density around the world, we have started to look at inundated cities as potential locations for the development of a new urban model. Although partially submerged, the infrastructure of these coastal metropolitan cities can be rehabilitated through a hybrid system that depends on buoyancy, hydrostatic pressure and conventional structural framing. In order for this revival to be successful, the chosen flooded environments must have a rich cultural and historical past, established infrastructure, and high rise structures that are tall enough to withstand the rise in sea level. We chose to use San Francisco, CA. 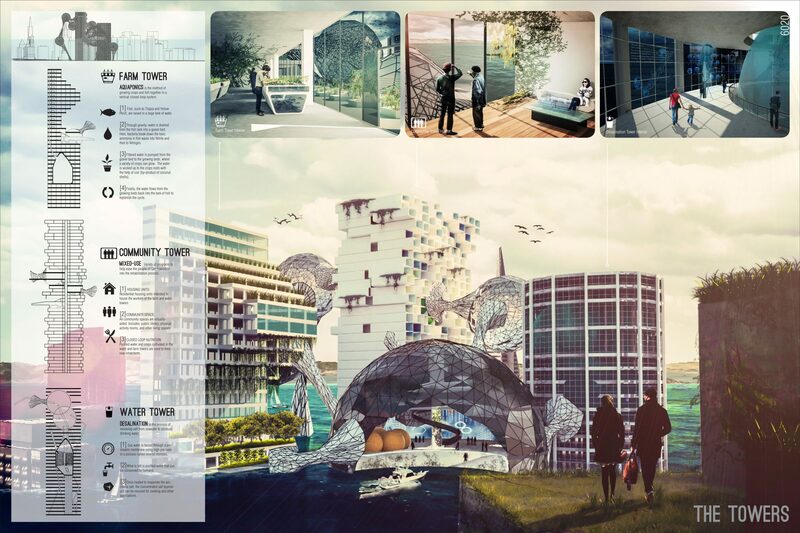 as a starting point for our rehabilitation system for its iconic culture, urban density, and coastal location. Our project is situated in the interstitial space of three partially submerged towers in the financial district of San Francisco. Each tower has been re-purposed to serve basic human survival needs while aiding the reconstruction of San Francisco as an underwater city. The Farm Tower is devoted to closed loop farming systems such as aquaponic tanks and farm shelves— providing a local food source for its residents. The Water Tower has been retrofitted to hold a water purification system to filter ocean water through desalination in order to maintain potable water supplies. Lastly, the Community Tower is intended to serve as a housing complex and community space for people to live and socialize. The interstitial space between these towers is occupied by a modular system of nodes that connects each tower back to a central hub through structural tubes. 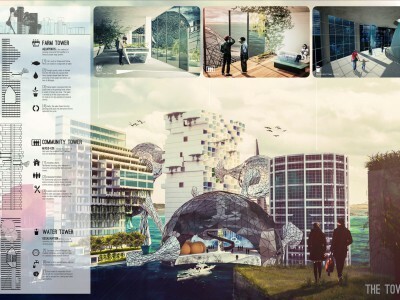 Ideally, this system that can be replicated in other districts and cities to allow for a new type of urban growth. The Central Hub serves as an extension to the community tower through a variety of programs. 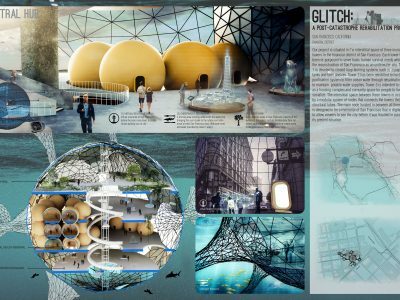 The top floor of the hub, which is fully above water, serves as a semi-outdoor park. The following two floors are designed to be a memorial museum of San Francisco city that is visually aided with holographic virtual reality and surface imaging panels that allow visitors to see San Francisco before it was flooded in parallel with its present situation. The main attraction is a series of individualized pods where visitors can experience iconic locations in San Francisco that were flooded through 360o projections.Essentially, GLITCH pays tribute to fallen cities, such as San Francisco, through snapshots of the past while simultaneously allowing a new type of urban development to take root.